Manned Submersibles are a classic field of underwater engineering. 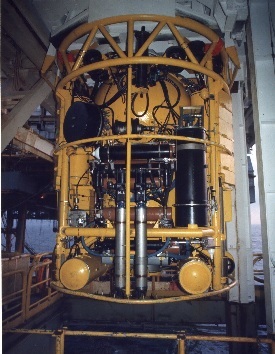 The Mobile Diving Unit (MDU) was a two compartment diver lockout submersible operating from the MSV Tharos, owned and operated by Occidental Petroleum. Deershill Engineering Ltd. provided an engineer working in house to support the development and operation of the submersible. The work included development of the services umbilical, payload enhancement, propulsion enhancements and developing tooling capabilities for diver operation. 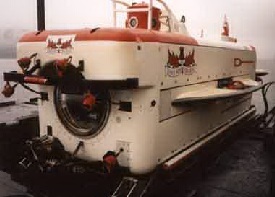 The MSV Tharos diving system has now been decomissioned, but by 1991 the MDU had logged over 3000 dives, probably more than any other diver lockout submersible at the time. 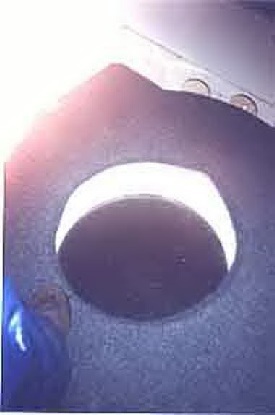 The picture above shows the rear of the MDU. 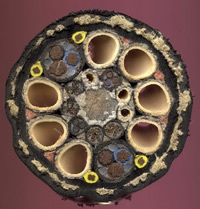 The picture below displays a cross section of the services umbilical developed for the MDU. The cable was built as a managed project where components were purchased from individual manufacturres then free issued to an assembly contractor. Assembly of the cable was carried out in four stages at different factories in the UK. British Ropes Doncaster, BICC Supertension Erith, Bridon Fibres Charlton and Multiflex Leith. The project structure ensured that each stage of construction and assembly was performed by the most suitable company. 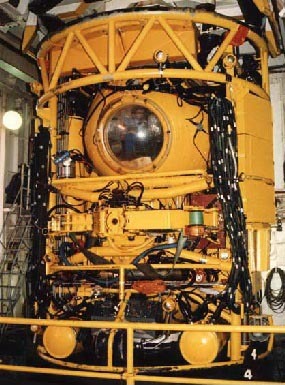 The picture below illustrates a lower hatch conversion designed for the Taurus diver lockout submersible which was refitted for operation as an observation platform. The diver lockout hatch was converted to provide a large diameter downwards looking observation window. 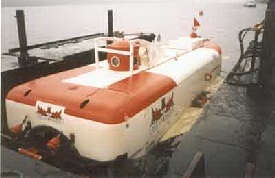 The Taurus submersible, capable of diving to 400 metres, is one of the submersibles operated by Silvercrest Submarines and is available for both scientific, commercial and private hire. The photographs alongside show the submersible when it was operating in Loch Ness. The primary role was scientific survey but it also carried tourist passengers to view the bottom of the Loch in the time between scientific missions. 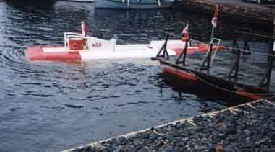 During operations in Loch Ness the submersible was taken out of the water for routine maintenance using a floating dock. The final picture alongside shows the submersible fully lifted. Taurus is currently working in South Africa. The owner and operator of Taurus, Silvercrest Submarines, can be reached by clicking on the link below.